On-Page SEO (Part 4): Optimizing Keyword Density | Thill Logistics Inc.
You have your content and now you’re optimizing it with your SEO keywords, but how many times should you include each keyword in your content? Finding the right balance is important so search engines don’t think your site is over optimized resulting in a decrease in ranking or no ranking at all. The strategy here is to perfect your keyword density. Keyword Density is the measurement of the number of times your keyword appears within the content on your web page versus the number of total words on the page. If your content is 500 words and your keyword appears 5 times, then the keyword density equals 1%. 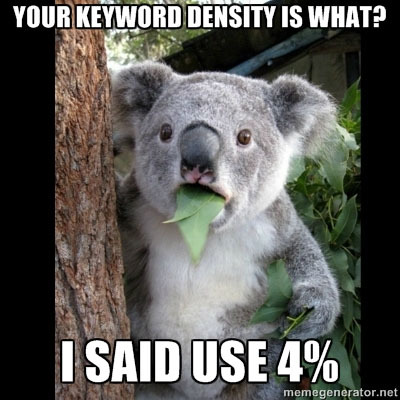 A good keyword density is around 4%-5% (less if shorter content). Make sure you use your keywords in the title tag, description tag, and h1 tag and then add them within your content a couple more times. Never try to overstuff your page with your keywords. Keyword stuffing is frowned upon. It’s like over indulging yourself with food; it’s just not in your best interest. When adding keywords in the content, make sure you use your keywords within your internal links and also keep your keywords as close to the top of the page as possible. Another successful tip is to add your most important keyword in the first and last sentence of your content. These easy strategies will help your page improve it’s ranking in search engines and hopefully provide more traffic to your site. Remember, optimizing your SEO efforts should be natural. If you feel like you are over optimizing, stop, sit back, and ask yourself, does this look and feel natural? I encourage you to continue to invest time and resources into SEO. It’s the best thing you can do for your website. This entry was posted in Blog and tagged SEO. Bookmark the permalink.